“Do not judge a book by its cover” – this is an old saying that tells people to not always judge something by the very first impression. This is applicable for those who are visiting Melaka for the first time as some people might think that Melaka is a small city with nothing more than ruins and museums. 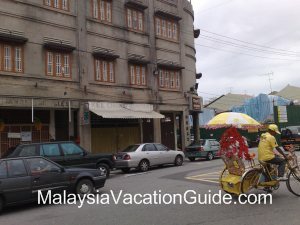 However, you will be taken aback by what you see in Melaka town. Thus, “Do not judge Melaka by its size”! The trishaw is still being used to take passengers from one part of the town to another. If you would like to explore the town, there are several alternatives that you can choose from. First, you can opt to walk where you can have more time and freedom in deciding where to go and how long to spend in each place. Second, you can hop on to the unique “man-power” transportation – the trishaw where the “driver” will paddle around the town and you can sight-seeing in a more comfortable way. 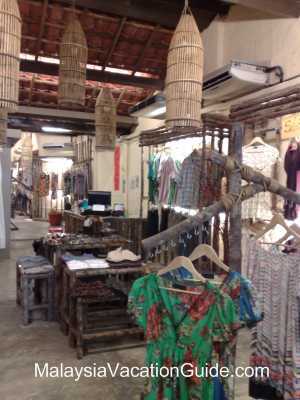 As walking around the town, you will see a lot of well-preserved typical Chinese shop-houses along the street. Most of the shop-houses still retain the wooden window and doors; and the old architecture until today. By looking at these buildings, you will feel like going back to Shanghai in the 80’s where shop names that made up of Chinese characters are all around the street. Besides that, there will be stalls selling mouth-watering traditional sweet delicacies along the corridors of shops. The famous Jonker Street is a must to visit. There is so much you can see at Melaka town. 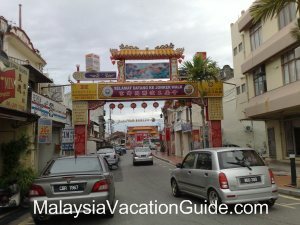 At one of the most famous place in town – the Jonker Street, you can see old and newly renovated shops, restaurants, café, temple, clan associations and even an appointed place that provides funeral service. It is so unbelievable where all these that seem unrelated can co-exist in a harmonious environment. You will never feel a sense of awkwardness in this small street that comprises different buildings of diverse background. 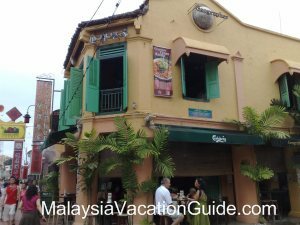 While visiting Jonker Street, it is worthwhile to check out the streets nearby. Jalan Hang Lekir and Jalan Tun Tan Cheng Lock nearby will trigger a stronger sense of culture. When you see the famous Geographer Café that acts as a landmark, turn right and you will be heading to Jalan Hang Lekir. During weekend, there will be stalls selling collectibles that remind you of your childhood days. Walking further down, you will make your way to Jalan Tun Tan Cheng Lock. This is where you can find plenty of lodging,unique architectures and buildings that reflect the heritage and lifestyle of the Baba Nyonyas. Within walking distance, it is amazing where one is able to discover the diverse cultures of Melaka through the unusual streets. Furthermore, it is alsoa journey that is fill with surprising elements as you will never be able to anticipate what you are going to encounter next. Having an evening walk along Melaka River and enjoy the amazing dusk view will also be another attraction in Melaka town. Slow walk along the river, beautiful sunset with mild wind blowing to your face simply compliment your evening in Melaka. By the river is where the huge Samudera Handicraft centre located. You can get some souvenirs from there. Further down, you will see a magnificent ship – the maritime museum which is a replica of a Portuguese ship. 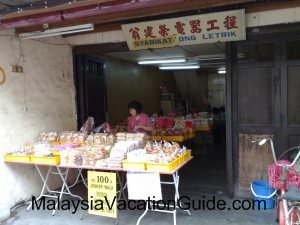 A shop selling Melaka traditional delicacies. Recently, the state government has opened up another new attraction which is being known as “Tamingsari Tower”. It is adjacent to Padang Pahlawan and approximately 5-minute walking distance from Maritime Museum. You can see the breathtaking view of Melaka town through the revolving cabin which will bring you up to as high as 80 metres. 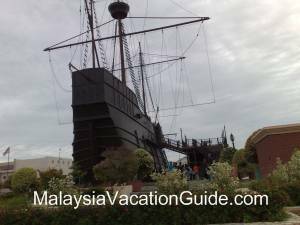 This will be one of the best ways to view Melaka town in a fast but exciting and unusual way. For those who would like to do some shopping, no worries as there are some nice and comprehensive shopping complexes in town. The most renowned one will be Mahkota Parade located at Jalan Merdeka. You can take the domestic Panorama bus which will bring you to this shopping complex. 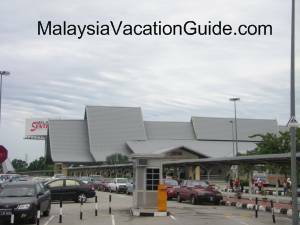 Besides, you can also head to Jalan Hang Tuah where several shopping centres such as Hang Tuah Shopping Complex and The Store are located. 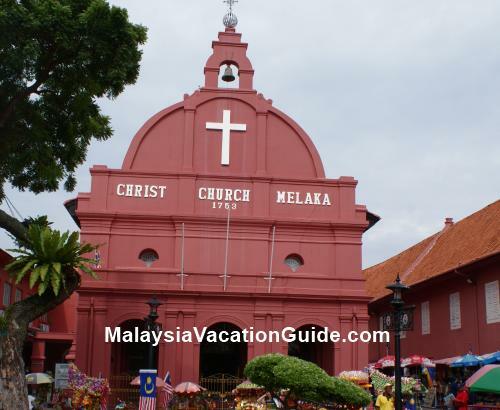 Melaka town that consists of both modern recreation and cultural heritage will give you an unforgettable tour. 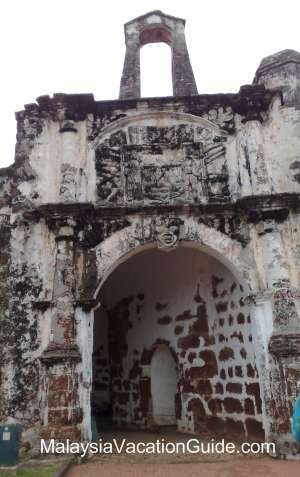 The town is centralized where most of the cultural heritages are adjacent to each other and easily accessible. You do not have to waste a lot of time traveling from one place to another. 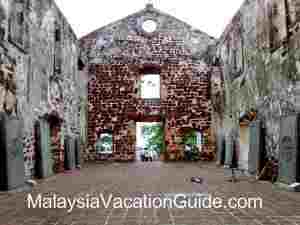 Without having to venture far, you will be able to fully experience the glorious history of Melaka.